Renting a one room cozy cottage with a king size bed in the loft. Cottage on the water, with private beach front. Holiday & weekend rates may apply. There is availability for rental of, (2) paddle boats, (2) kayaks, (1) two man canoe. For touring the lake. There is dock spaces available to rent for personal water crafts. The camp has great views from the deck, dock, and beach. Main room has full kitchen, microwave, refrigerator, and a gas stove. Living area has a fold up table with chairs for four, two bar stools at breakfast bar, with a TV and VCR. Bathroom has nice corner shower, vanity, and incinerolete toilet, and a heated towel rack. Loft has a king bed with TV and a VCR. The summers are great for boats, dock space available, fishing and swimming in the crystal clear water, enjoy the scenic views, kayaking, canoeing, going for a paddle boat ride. Incidental charges for amenities offered to guests. Are bottled water, fire starters, fire wood, paddle boat and canoe use, and dock space. These items are expained in detail, and the cost of items listed in the hospitality welcome guide section "essentials ". The winters are really nice, cottage located centrally between Stowe ski resort, smugglers notch ski resort, and jay peak ski resort and indoor water park. We have the information for discounted ski tickets, indoor water park, local events, and package deals. Eden is great in the north east kingdom with the most record snow fall in Vermont. This also makes the best ridding for atv's and snowmobiling, being able too ride from the private road directly to the V.A.S.T trails. There is ice fishing for the enthusiast, perch, bass, rainbow trout, and the occasional pickerel. All this snow loving fun, bring your x- country skis, and snow shoes, and make your own path in the snow of Vermont. I am a fun loving country boy at heart. I have lived in Vermont my entire life. I enjoy the summers on the lake, swimming, water sking, hiking, biking, sitting by the campfire by the water, roasting marshmallows. The autumn season has the most magnificent, beautiful bouquet of colors to see, a leaf peepers dream. The fall season is a time to enjoy scenic views, listening to the cool breezes whispering through the trees, bringing in the old man winter. The season of winter coming apon the mountains, brings the smell of burning fire wood and crisp cold air, it's time to get the skis tuned, get the snow shoes down, and get the snowmachines and equipment ready for the long winter. Don't forget mud season, bringing in the spring, getting ready to ride the four wheelers, and get dirty head to toe, bringing in the summer, and to do it all once again. So if and when I'm able to get away for a bit. I love to go to the southern most point, enjoying the warmth and blue water off the Keys, I try and get out and get some ocean fishing in, catch a fish if I'm lucky. Then on my way by the cape I love to cruise the beach and hang out on the islands of Martha's Vineyard and Nantucket Islands, hoping to catch a blue or a striped bass, like I did with my brother when I was young. I enjoy a good action film, the gangster movies are the best, throw a marvel movie in between for a great family night and I'm a happy man. I love my family and like to have a lot of fun. So come on up I'll be waiting for ya, come enjoy the best in Vermont, see ya when you get here. The cottage has splendid scenic views of the lake and the green mountains, leaves are bright and beautiful, during autumn season, this is a leaf peepers dream world. The cottage is centrally located between three major ski areas, Jay Peak Resort, Stowe Resort, and Smugglers Notch Resort. Enjoy winters in the Northeast Kingdom, this area has the most recorded snow fall in Vermont. Enjoy down hill, and cross country skiing, ice fishing, snow shoeing, dog sled racing, and snowmobiling on V.A.S.T. trails. This area is perfect to just to relax, enjoy the best that Vermont has to offer in country living in the Great North East Kingdom. 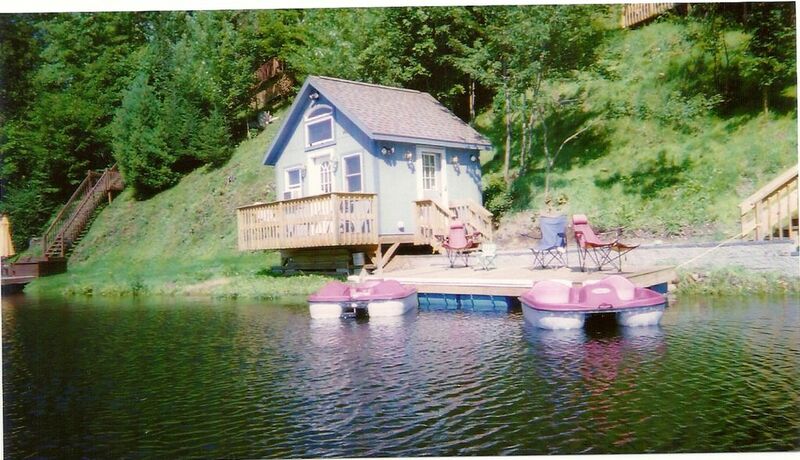 This cozy cottage with loft on water front, for $45 on week nights, and $65 on weekend nights, holiday weekend rates may apply. A two night minimum stay is required at time of reservation. We have availability for two nights stay, week or month reservations. Travel to Burlington airport is one hour and to Montreal airports is two hours. The cottage is centrally located between three major ski areas, 30 minutes travel to Jay Peak Resort, Stowe Resort, and Smugglers Notch Resort.The camp is supplied with utility water for showers and dishes. Things that are needed to bring, for your stay, is potable drinking water, personal use items, consumables. Fire wood is avalible for $7.00 dollors a arm load. I have Information, you may be able to get discounted ski tickets, indoor water park passes, events, and package deals, The cottage is fully furnished, kitchen / dinning areas, includes, cooking, and dinning wares, coffee maker, toaster. Bathroom includes, wash cloths, hand, and bath towels. The king bed is furnished with king comforter, blanket, sheet set, king pillows, and throw pillows. There is a $50 dollar cleaning fee included in price. The cottage is centrally located between three major ski resorts. there is a 30 - 40 minutes travel to Jay Peak Resort, Stowe Resort, and Smugglers Notch Resort. Outside cottage, include a front deck on cottage, sandy beach area, fire pit, two large decks with patio furniture. The cottage is located on the peninsula, a private drive, that extends into the middle of the lake, and has lake view's to both sides of the shore lines. This area is perfect to just to relax, enjoy the best that Vermont has to offer in country living in the Great North East Kingdom. The camp is supplied with utility water for showers and dishes. Things that are needed to bring, for your stay, is potable drinking water, personal use items, consumables. Fire wood is avalible for $7.00 dollors a arm load. I have Information, you may be able to get discounted ski tickets, indoor water park passes, events, and package deals, The cottage is fully furnished, kitchen / dinning areas, includes, cooking, and dinning wares, coffee maker, toaster. Bathroom includes, wash cloths, hand, and bath towels. The king bed is furnished with king comforter, blanket, sheet set, king pillows, and throw pillows. There is a $50 dollar cleaning fee included in price. I had a great time during my stay at the cottage. Everything was clean and Eric was a great host. The location was great for skiing at Jay Peak and exploring northern Vermont. I would love to stay here again one day if I get the chance. My friend and I spent a few days here and loved it. The cottage was very clean and cozy. The directions and instructions were spot on. Thank you Eric for sharing your adorable home with us. My husband an a I stayed here for 3 nights and enjoyed the quiet, beauty and majesty of Eden. Eric was a fantastic host and has created a sweet little escape. We will be returning this summer for a change of scenery and some lakeside fun! Thank-you, Eric! Eric is a great host! We enjoyed our time staying at the cottage and it was a great affordable way to go snowboarding and use the water park at nearby Jay Peak. Also it was close to Stowe and other towns just about 40 minutes south. All in all it was a great trip despite some freezing rain, we still managed to have a great time. Cute little cottage that was perfect for our weekend winter get away! Although I did not meet Eric, his directions were very helpful regarding parking, etc. It had snowed during the day before we arrived and everything was shoveled and sanded. The cabin was warm and cozy and made for a perfect sleep after a long day of skiing at Jay Peak. We met one neighbor as we were coming back the 2nd night who was very friendly. Took a picture in the morning after the snowfall. Breathtaking! We will always remember our time in the teeny tiny cottage! We had a great time staying at the tinny, tiny cabin! Eric is such a sweet guy and super helpful. We arrived late, which was absolutely no problem for him, the cabin was VERY clean and he did a great job shoveling and keeping the outside tidy even after it snowed. The views from the cabin are breathtaking. My favorite part about the trip was waking up in the loft, turning around to the picture window and watching the snow fall gently on the lake. The place is extremely peaceful and so quiet you could hear a pin drop. We strongly recommend this place for a getaway! The cottage has splendid scenic views of the lake and the green mountains, leaves are bright and beautiful, during autumn season, this is a leaf peepers dream world. The cottage is centrally located between three major ski areas, 30 minutes travel to Jay Peak Resort, Stowe Resort, and Smugglers Notch Resort. Enjoy winters in the Northeast Kingdom, this area has the most recorded snow fall in Vermont. Enjoy down hill, and cross country skiing, ice fishing, snow shoeing, dog sled racing, and snowmobiling on V.A.S.T. trails.The cottage is located on the peninsula, a private drive, that extends into the middle of the lake, and has lake view's to both sides of the shore lines. The neighborhood on lake Eden is a family friendly community. This is a beautiful vacation spot for all to see. There is public and private camp grounds for campers and RV's. There is a public beach, which has a play ground area for children, and two large cabana's, for large gathering's, parties, and weddings etc.